Homicide detective Frank Bennett has a new partner—dark, beautiful, coldly efficient Eden Archer. Frank doesn’t know what to make of her, or her brother Eric, who’s also on the police force. Their methods are . . . unusual. But when a graveyard full of large steel toolboxes filled with body parts is found at the bottom of Sydney harbor, unusual is the least of their worries. For Eden and Eric, the case holds chilling links to a scarred childhood—and the murderer who raised them. For Frank, each clue brings him closer to something he’s not sure he wants to face. But true evil goes beyond the bloody handiwork of a serial killer—and no one is truly innocent. This is a bit of a strange book to review. 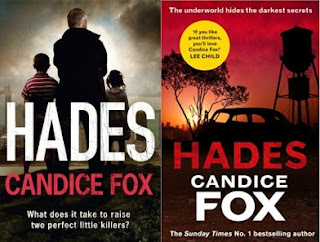 Recently released in paperback in the UK, Candice Fox's debut novel (published in Australia in 2014) kickstarted a meteoric rise for the Sydney author. She won back-to-back Ned Kelly Awards (Best First Fiction and Best Fiction) for this novel and its sequel, has teamed up with bestseller-factory James Patterson on a crime tale set in the Australian Outback, and has gathered plenty of high-powered blurbs from big names in crime writing. There's another Patterson co-write on the way, and Fox can splash "No 1 bestselling author" on her covers. Say what you will about James Patterson (personally, I loved his Alex Cross tales as a teen and as an adult I'm grateful for everything he's done to support bookstores and encourage children's reading and a lifelong love of books), he definitely knows how to spot talent that can tell a crime page-turner. Whether it's Liza Marklund in Sweden, Andrew Gross, or Candice Fox, many of Patterson's co-writers have shown substantial writing chops in their solo books (Marklund in particular is fabulous). Hades is an incredibly slick, well-told tale (particularly for a debut). Fox pulls the reader in immediately and the pages whir as Sydney detectives Frank Bennett and Eden Archer, a new partnership, join their colleagues are on the hunt for a dangerous serial killer. There's a great sense of the pressures of police work, the mix of personalities that can be like oil and water even as they've got a job to do as a team. And Fox does a good job giving us a taste of the Sydney setting. It's a dark tale, that burrows into some pretty sick parts of society. Grimy is an apt word. I can see why a lot of reviewers (and awards judges) loved it. Hades is compulsive. The bit that fell a touch short for me, however, was the characters. In sum, all the 'heroes' are pretty unlikable, and not in a fascinating noir or anti-hero kind of way. I just couldn't quite get alongside the main characters, so I was tearing through the pages entranced by the story but feeling a little aloof emotionally. Frank Bennett might be intended to be the reader's 'in' , but he's misogynistic among other flaws, often thinking about his chances of bedding his new partner Eden. Eden and her brother Eric are charming in some ways but cold and brutal in others. They come across as sociopathic rather than being flawed souls making mistakes as they try to do the right thing in a tough job. It's tough to put my finger on what didn't quite work: the things I note above aren't fatal and there are crime stories which work very well where those same things are present (eg Andy Sipowicz in NYPD Blue is misogynistic and prejudiced, but a brilliant compelling character, and Dexter in Jeff Lindsay's books and Joe the Carver in Paul Cleave's books are true psychopaths, but somehow work well). I think in the end I just found myself rolling my eyes occasionally with Fox's writing or character choices, which pulled me out of the story now now and then, breaking an otherwise great ride. Note that I'm saying all of the above with my picky reviewer's hat on. Hades is still a very good debut, and I can see why it got plenty of acclaim. Funnily enough, I found the title character (a shambling man who runs a rubbish tip, and is a 'fixer' for local criminals) the most interesting or multi-leveled. I'm curious as to where Fox takes the characters in the Ned Kelly Award winning follow-up, Eden, and beyond. I'd definitely read more of her crime writing. Overall, if you love fast-paced plot-boilers that delve into sick serial killers and the grimy fringes of society, textured with some shading of character and setting, then I'd highly recommend Hades. If you prefer more character-centric crime fiction that delivers greater richness or depth in the viewpoint characters, perhaps give Fox's successors for the Best First Fiction award a go instead: Emma Viskic (Resurrection Bay) and Jane Harper (The Dry).